Nowadays, urban public space is one of the most important issues in the debate around the Chinese cities as well as in the debate about European cities. Chinese urban culture attributes a fundamental and indispensable role to the street as a place of sociality, while it knows nothing comparable to the European square as a community space. The project was about the refurbishment of an ancient settlement in the periphery of Nanjing in China, the Pukou district, built along the backbone of the commercial Left Street and surrounded by the highway and the river. 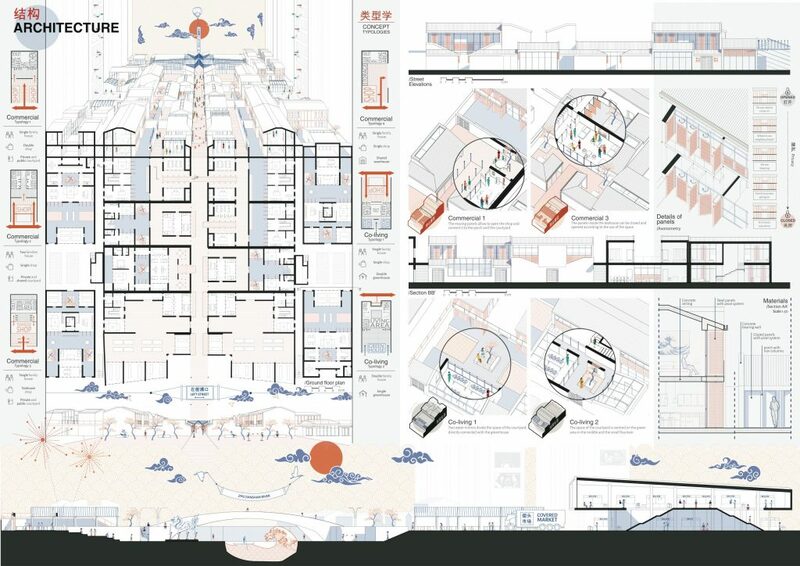 *The title is related to the particular shape of the roofs of the buildings, that take inspiration from the traditional types to define a new space, the public commercial courtyard. How has your Italian background defined and influenced your understanding of public space? Nowadays, urban public space is one of the most important issues in the debate around the Chinese cities as well as in the debate about European cities. Chinese urban culture attributes a fundamental role to the street as a place of sociality, that has nothing to do with the European square as a community space. I think that the Italian, and more in general European, idea of public space has quite different features and it is mainly related to squares or parks, while the Chinese street is something completely different, even from our concept of pedestrian commercial street. In these terms, I think that my background was an obstacle at the beginning because it didn’t help to understand the real core of this issue, but after some time and some meetings with Chinese professors and students I managed to enter deeply in the subject and I used also my background to design the new public space. 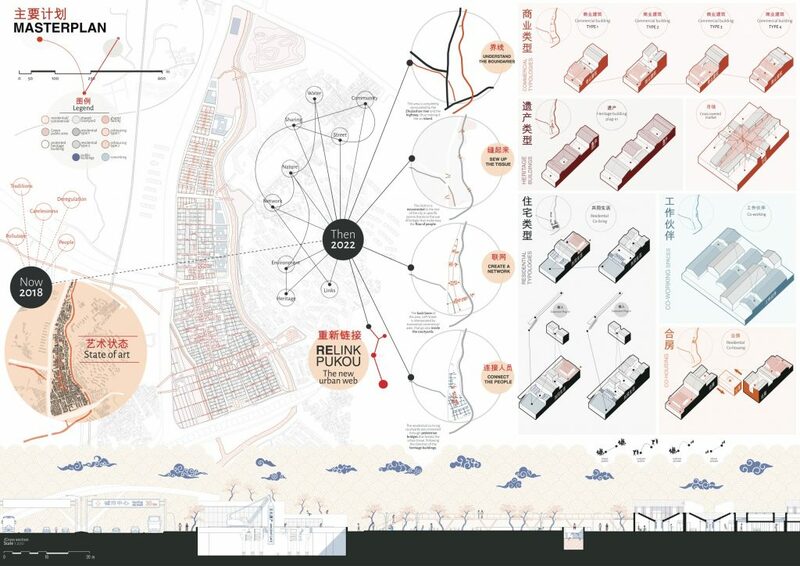 Moreover, the dynamics of the urban morphologies and architectural types in the contemporary Chinese cities have been approached using Italian urban studies’ methods to investigate the urban fabric, the urban form and its possible development through re-design and re-generation. To what extent has the way we use public space changed dramatically in the last few years? As I could observe and study in the last few years, the concept of public space is very hard to define and even some of the greatest urbanists who tried to give an answer to the matter were not so clear. The use of this space has radically changed over the last years and I think that, after the exploit of the cars and the uncontrolled development of the urban slums and periphery all over the world, now the public space of the square and the street has been rediscovered and protected again, even enhanced with new functions, manifestations and events. On one hand, in the case of the city where I live in Italy, Turin, till 10/15 years ago the public spaces were used as parking areas or residual spaces, but now many streets have become pedestrian and the city centre is more alive than ever and also more welcoming towards tourists. On the other hand, the case of China is not so different as it might appear because, even though they seem to have forgotten their traditions in a globalized approach towards urban development, there are some projects that are trying to rediscover the idea of the street as a social place. In my project, I tried to do the same. Can we talk about a new virtual public space? This is not an easy question, but very interesting. Over the last years we have watched the rising of social networks with all their positive and negative consequences. The Chinese case is very related to this matter, since all the people are very connected and have a strong relationship with the Internet. 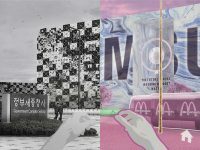 Let’s think, for example, to the movie “May we chat?” by Philip Yung, the mirror of an Internet addicted society. More or less all over the world, the rules of the social interactions between people have changed dramatically and a new public space, a virtual one, has arisen. Can this be controlled? Is this a real space? I don’t know honestly, but I think that one of the challenges of an architect’s future job will be also the management of this new virtual space and maybe its integration with the real physical world. Did you visit the site? Unfortunately, I didn’t have the chance to visit the site mainly because of the distance and the travel costs. The professor provided us some pictures from three years ago and some others of this year, together with videos. 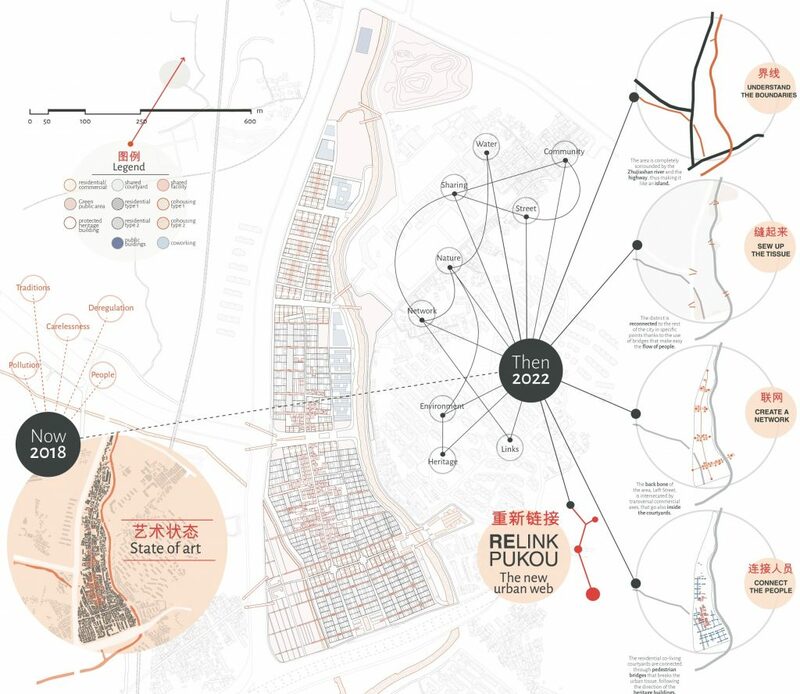 The most interesting thing that emerged from this material was the radical change in act in the project area, the Pukou district, in the periphery of Nanjing. The city bureau has in fact decided to refurbish the area, destroying all the existing building. The pictures before and after the demolitions are really impressive and now all the area appears like a war zone, where all the traditional values and public spaces have been erased, thus making the project a real challenge. 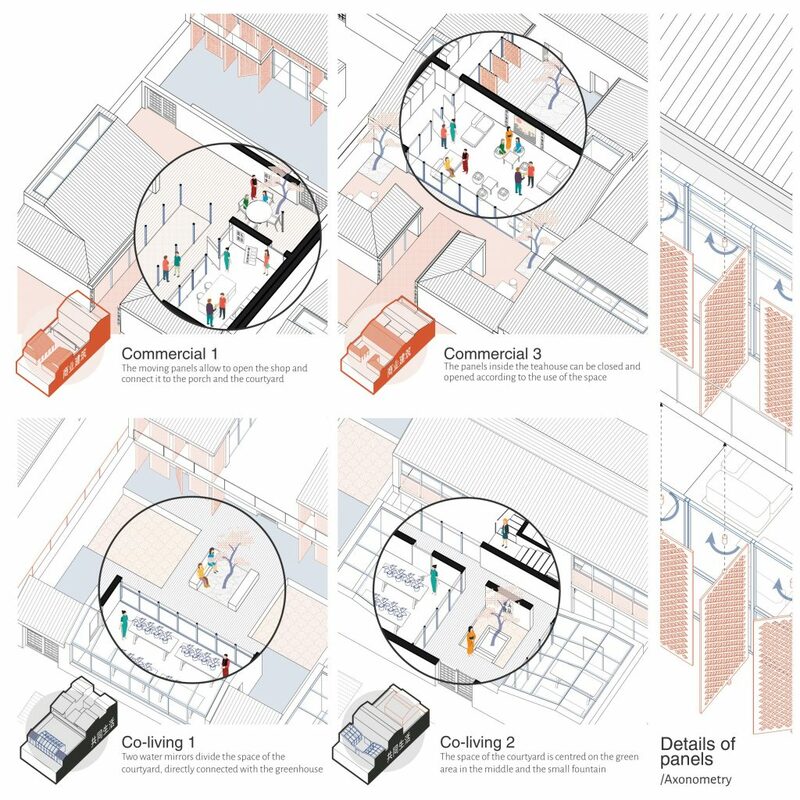 How did you approach the refurbishment of this area in relation to public space? The project area is one of the few left pieces of the old town. Using as reference the old maps, it is possible to recognize that the left settlement was located in the eastern part outside the city wall of the town of Nanjing. The area is characterized by the presence of two longitudinal main streets, the so called “left street” and “the left backstreet”. The importance of the street in the morphology of the place is underlined by the fact that the oldest and traditional houses are place along it. The project aimed at protecting and enhancing the existing heritage in a new and creative way, focusing especially on the street as space of sociability and interactions. 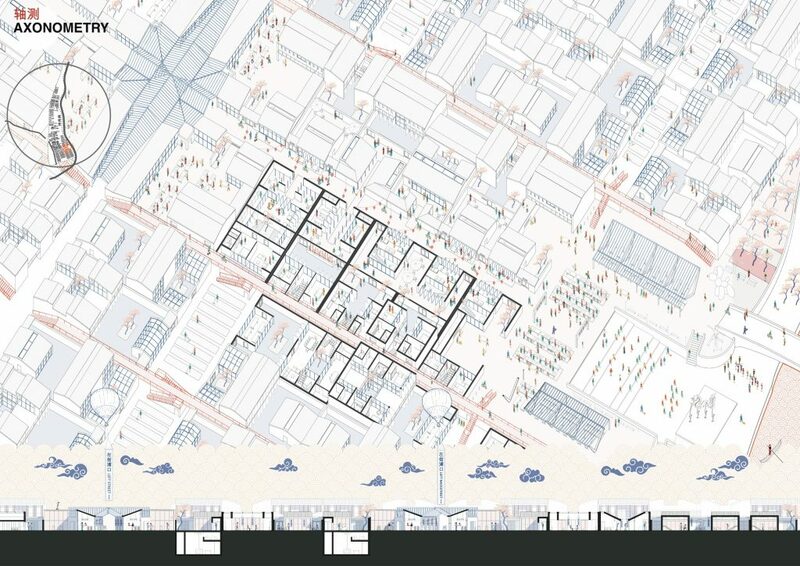 In the case of the new buildings, based on the reinterpretation of the traditional Chinese courtyard house, the refurbishment was carried out both by designing shared courtyards with agricultural vocation and by opening part of the courtyards, thus creating a network of commercial spaces. 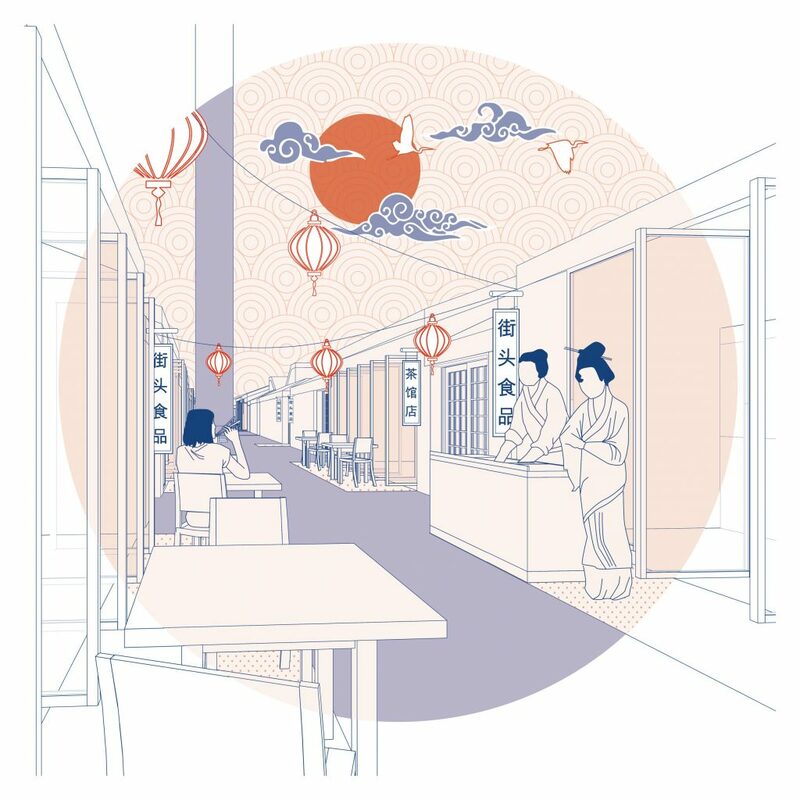 The idea of small public spaces spread inside the buildings was mainly driven by the strong value of street food in the Chinese culture. What defined the articulation of the project through composite boards? 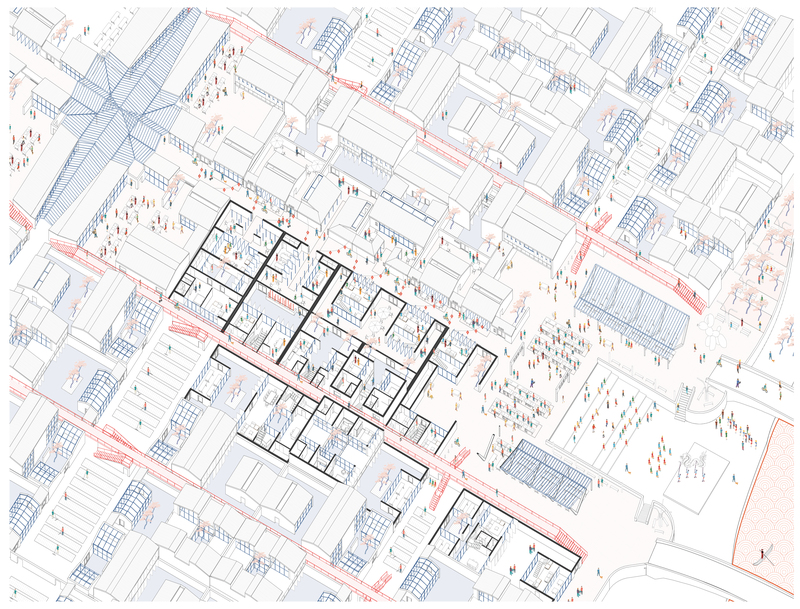 The general organization of the boards was based on an experiment: a cross section developed in the early stage of the project to design the masterplan and show the relationship between the street, the buildings and the courtyards. 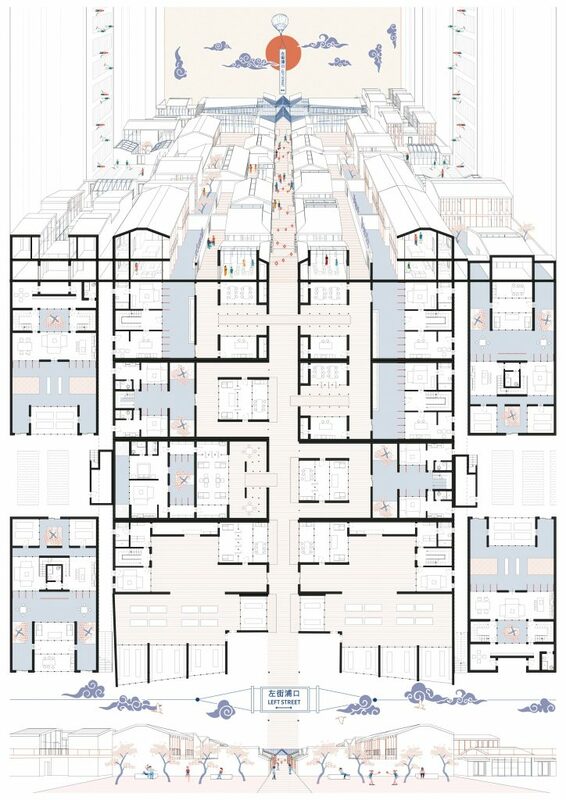 Having decided to put the continuous section at the bottom of the long strip of the boards, the rest of the space was divided in sections: masterplan and concept about the new typologies; the axonometry showing the life in the street; the definition of the architectural language through drawings and views. 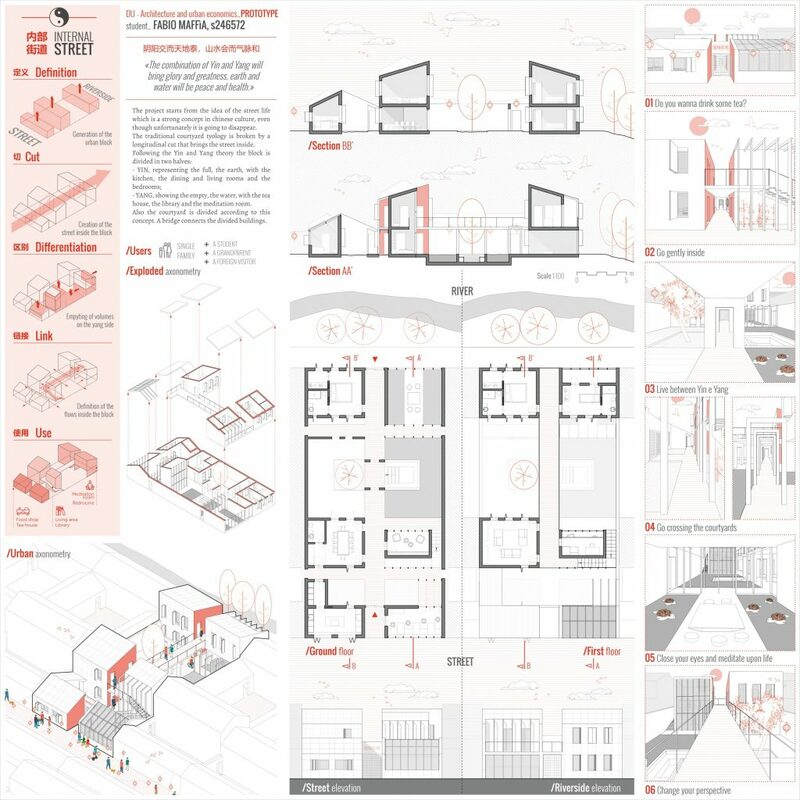 Each drawing was carefully chosen in order to explain the project in the best way. Did you ever think of exploring diverse mediums other than that of the drawing? Actually, with this project I had the chance to try something new. A part from the use of physical models that was not a novelty in my architectural career, we were asked to write a storytelling to envision possible future scenarios and make a couple of video teaser to present the project to a possible investor/client. It was very challenging at the beginning, especially because I didn’t know how to use the software and how to organize the montage of the scenes. After some attempts, I managed to have good results. I can say that the video teaser, derived from the cinematographic reality, could be an interesting new way to explore the possibility of a project and represent an easy and immediate way to communicate it to the people. How important was the drawing in articulating and developing the project? In this case the drawing was quite important in the representation and communication of the project, but not the only mean as I explained before. The support of the BIM platform that I used to develop the project was really helpful to manage a huge area in such a short time. Inspired from the traditional Chinese rolls, I tried to use the vector images to convey the message of the project, instead of using more realistic renders, that are often only fake attempts to be realistic. I wanted to tell a story with my project and I thought that the best way was to use a traditional kind of drawings with some provocations, like the inception-like perspective view in the architectural board. Are you interested in exploring the role of public space within cities further? I often dealt with the public space within the city during my university career and I think it could be very interesting to go deep in its understanding. It has been very challenging to face the problem of public space with the eyes of a different culture and I would like to explore it more in the future. Honestly, I don’t know yet what I will focus on in the next years, but I am really interested in the applications of new technologies in architecture to improve everyday life and interactions between people. Born in 1995 in Turin, in the North of Italy, Fabio Maffìa grew up with the passion of architecture. Fabio is now enrolled in the master’s degree Architecture, Construction, City, still in Turin, but he is also going to study at TU/e in Eidhoven for the next semester with the Erasmus exchange programme. Thanks to the Q&I programme for talented students in the bachelor and currently to the Alta Scuola Politecnica, he had the chance to make rewarding experiences, such as international workshops, innovation management courses and multidisciplinary projects. Among his professional experiences, he worked for two months in the firm Boffa, Petrone & partnersin Turin as an architectural intern and collaborated with Maatarchitetturafor four months, working mainly at the architectural scale as well as about housing and interior design. He strongly believes in the power of new technologies and their applications in the architectural and urban field. 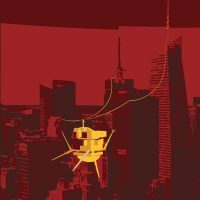 He is interested in the development of future smart cities and the investigation of new ways of defining the urban morphology.